Gururaja Anemajal was initiated at an early age of 10 into yogic practices by his grandfather, Sri Madhava Bhat, who is a disciple of Guruji Sri K Pattabhi Jois. Gururaja has done his B.Sc from Mangalore University and received his B.Ed from Kannur University, Kerala. 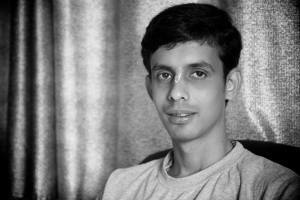 Since his main objective is to learn yoga since childhood, he studied M.Sc in yogic science at Mangalore University. After pursuing, Master in Yogic Science, he extended his sadhana by devoting himself in the practice of traditional Ashtanga yoga under the guidance of Smt. Saraswathi Jois and Sri R Sharath Jois, daughter and grandson of Guruji Sri K Pattabhi Jois. He has received the Authorization Level 2 to teach up to Full Intermediate (2nd) Series from Sri R Sharath Jois. With deep gratitude and respect he shares the teachings as he has been taught by them and emphasizes on regular practice.